I’ve met a couple local bloggers before! How cool you get to meet up with so many amazing bloggers!!!! Have fun! Thank you!! I’m so excited to meet so many so soon! I’m super jealz that you are meeting Suzy!!! I’ve met two other bloggers. A bunch are coming into town for the Runner’s World Festival in a few week so we’ll see if any meet ups happen! So bummed I didn’t know YOU when I ran Lost Dutchman last year!!! Have FUN! We’re gonna make it happen someday, believe you me. Yes we will!!! I need to come back to AZ and redeem myself because I threw a hissy fit the last time I ran one there, haha! Yes, OF COURSE we are going to find time to meetup! I am going to send you an email today 🙂 I’m pretty that we’re staying in the same hotel, so meeting up should be super easy!!! Holy hell, we now talk every day, all day! How crazy is that?!? I’m glad you wrote about this! I’ve been blogging for a couple years now too but I haven’t wanted to meet anyone and I’ve gone out of my way to stay really private about stuff on my blog. Part of it is because of mine & my husband’s jobs but it’s also just about being kind of private anyway (except about running! then I can’t shut up!). But now I told some blogger followers/friends I’d meet them at MCM & Disney this year. ha! It feels so so weird but reading your experiences makes me feel better about it. And runners are always such nice people in my experience anyway! You know that I love meeting my bloggers to become blogging friends in real life. And you are PART of the schedule, my dear! Oh yes! Would love to meet up. So excited for you to run Chicago!! Please let’s make it happen!!!! xo! Jealous that you two get to hang out together. Or you guys do New York City next year . . .
Have fun in Vancouver!!!!! You are going to meet up with some awesome bloggers in Chicago…so much fun!!! So fun! I’ve only met one blogger IRL, and she lives near me so it’s not all that crazy. But I’ll be meeting a bunch of my blog friends at Wine and Dine in November, yay! WnD is going to be so much fun!!! Can’t wait for pics! I’ve never met other bloggers- outside of the SLO ambassadors- but I’ve seen them at races. I’ve always been too chicken to go say hi! I love meeting blogger friends. I’ve only met a couple through my current blog, but I’ve met other friends through my old blog (many many many years ago). We’re still friends and we went through so much together and really bonded over our posts (when you’re in your very early 20s, there’s a lot of emo-blogging going on). We often have fun talking about what we used to write and say, “Remember the time when I thought X was the most horrible thing ever and my life was over?” Then we have a good laugh. YES!!! I’ll shoot you an e-mail soon!!! You are so lucky to have met so many bloggers and have more that you get to meet! I am so jealous you get to meet Suzy!!!! 🙂 I have met Heather @ Girl Goes Running which was awesome for me because I really love reading her blog. I have also met Merenda from Fairytales and Fitness. She is a very sweet girl and we had a lot of fun chatting. I get to me Ali @ Hit the Ground Running and Kristina @ Blog About Running when I run a half in December! I am heading down to their neck of the woods in FL! CAN’T WAIT! I AM SO EXCITED TO MEET YOU ON SATURDAY!!!! And I happen to enjoy uncomfortable closeness. Watch out for my stealth bum grab. I can’t believe Chicago is in like two weeks!! 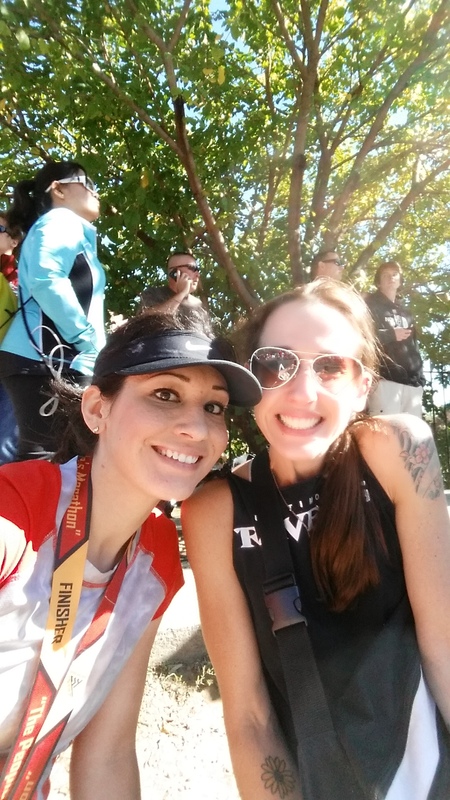 I’ve met Kristina at a race, and a few virtual friends from online running groups on facebook. I’m excited to meet more this winter! I love how blogging brings people together IRL. It’s my time to renew as well – and funny enough, these same thoughts are what got me to renew last year! I’m definitely not as active with my own blog as I used to be, but I love making a connection with other bloggers! Last year alone I met Salt, NYC Running Mama, Jess from Pace of Me, and Lisa from Running Out of Wine 🙂 A couple years ago I met Mile-Posts, and this year I had a quick meet up with Sweaty Mess Mama. It’s crazy to think of how many bloggers I’ve actually met! I have a list of those I’d like to meet IRL too, and I can’t wait to check you off the list next month! When will you be in town? I’m flying in on Friday morning, and leaving on Tuesday. I love meeting online friends! You were one of my highlights for sure! So excited that you will finally get to run with Mar! She is the best! I CANNOT WAIT!!!! I’m still kicking myself for MCM but we’ll make it up in January. I’ll be ready for AZ temps by then – yay!! Oh my gosh, it’s going to be AMAZING!!!!! !